WYMAN MEINZER - Wyman Meinzer’s inborn love for his home state of Texas and for capturing its unique beauty, began on the 27,000 acre League Ranch on the rolling plains of Texas where he was raised. His uniquely spectacular photography has translated into 22 books and over 250 magazine cover credits. 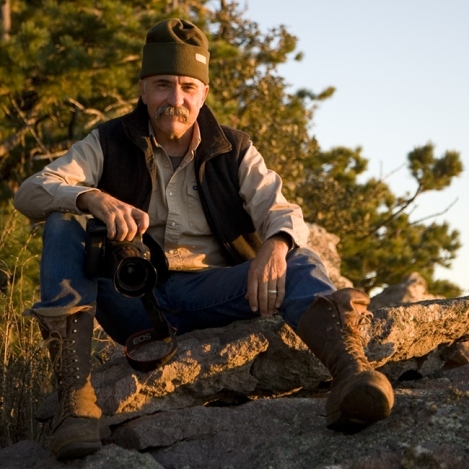 The Smithsonian, National Geographic, Time, Newsweek, U.S. News and World Report, Audubon, Field and Stream, Outdoor Life, Texas Parks and Wildlife, Texas Highways, BBC Wildlife and many other publications have featured his work. “My theme of intent,” he says, “is to be on site at the greatest light.” It is a theme that finds him “chasing the light” from sunrise to sunset, from one end of the state to another. He began recording images of his home area in the rolling plains because, “The Texas plains region was largely unexplored until I started” filming there. He frequently shares his knowledge and techniques in workshops where he enjoys giving personalized attention in small, intimate groups of students.